Greetings from California! We are having a great time, and I cannot wait to share everything with you. In the meantime, HAPPY HALLOWEEN! Halloween is my most favorite holiday, and I can actually say that I am disappointed to miss it at home this year. But even if I'm not there, I've rounded up a few happenings around Atlanta for your celebrating pleasure. Have a spooktacular Halloween! Tonight walkers from across the city will gather at Cypress Street Pint and Plate in their finest for an evening of thrills during the inaugural Cypress 80s Zombie Prom. Beginning at 8 p.m., makeup artists will provide guests with zombie “make-unders” to help transform Midtown’s favorite neighborhood haunt into a retro 80s style prom scene. 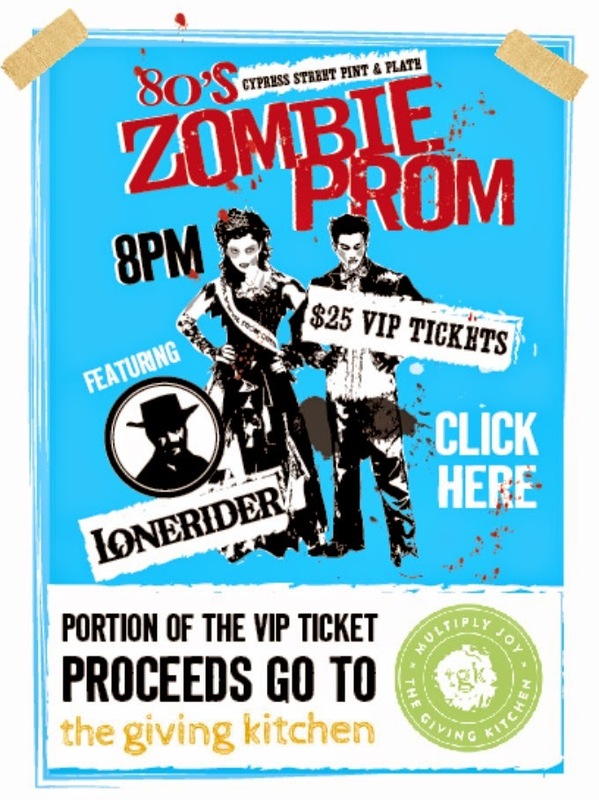 In the spirit of tradition, Cypress will award the evening’s best-dressed pair the coveted titles of Zombie Prom King and Queen, as guests capture the evening’s best moments in an undead photo booth, complete with a backdrop to set the theme. Plus, Cypress will donate a portion of VIP ticket sales to The Giving Kitchen. General admission is free and VIP tickets are available for $25. We love going to Cypress to nosh on their BBQ egg rolls, and I am sure this event will make the place even more fun! Join Winter Wren for a spooktacular celebration this Halloween. Beginning at 6 p.m. on October 31st, all ages and pups are encouraged to get into the Halloween spirit at the stylish boutique with trick-or-treating, spooky cupcake decorating, a costume contest and more. All guests in costumes (or if guests are simply escorting their favorite little monsters or furry costumed friends) will receive 20% off all purchases that evening. RedPepper Taqueria – Day of the Dead Celebration, November 1st, 5 p.m. I have to admit that I've only been to Red Pepper once, but I would have loved to attend this event. Head to either location on Saturday, November 1st as they celebrate Day of the Dead. With live music, traditional decorations, specialty cocktails, and more, all ages are welcome to experience an unforgettable day that also includes complimentary face painting from 5 to 7 p.m. at Briarcliff and 7:30 to 9:30 p.m. at Buckhead. Kids are also invited to create their own masks, while specially designed masks from the Red Pepper team will be available for purchase. 100% of proceeds will be donated to their co-worker and popular bartender Jonathan “Spanky” Billick to help cover medical expenses in his fight against melanoma. Love an event with a good cause. Makes it even more fun than anticipated. Make your Halloween and your weekend a fabulous one!